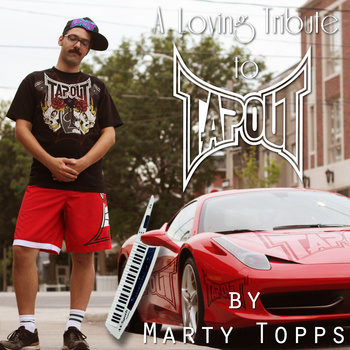 Last month, the Risky Fuel household stumbled upon an album called A Loving Tribute to TapouT, a collection of 10 magical and visionary tunes that celebrate the fight-inspired TapouT clothing brand without ever mentioning MMA whatsoever. 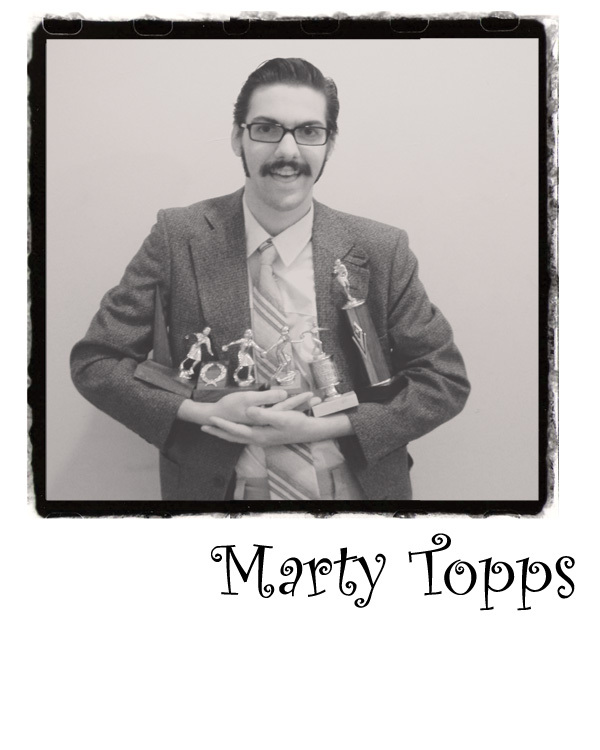 After spending a solid week tapping out to hits like “TapouT Me Out,” “A Shirt For Me,” “TapouT 4 Friendship” and “TapouT in HeaveN,” we decided that it was time to learn more about Marty Topps, the musical comedian and the visionary behind the album. Marty (also known as Isaac in non-comedy life) has been busy since releasing his loving tribute in September of 2013. His video “Beep Beep (Buy Me a Jeep),” in which Jeeps get the TapouT-esque Topps treatment, won the Laugh Sabbath Film Fest at North by Northeast last summer, and he just released a new album called LIVE! From the Rotary Club. He’s also performing at the 10th Anniversary of the Toronto Sketch Comedy Festival. But he was kind enough to revisit the past long enough to indulge us in our TapouT obsession. I’m a longtime music writer and I’ve been writing about MMA for a few years now and your TapouT album spoke to me. (laughs) Thank you. Are you an MMA fan? Yeah. I used to train at Toronto BJJ and I got sucked in that way. Oh! So you’ve been to, like, Beatdown Sports? Oh my gosh. That’s where I bought my first TapouT gear. They didn’t seem to excited with me there because I brought, like, two buddies and we were just giggling. But it was great. I read in another interview, though, that you first discovered TapouT at Winners, not Beatdown. I did. That’s right. We were just looking around at discount bins and we found it there. Was it an epiphany for you? I don’t know! I think we just heard the brand name a lot kicking around. To be honest, I’ve never seen a single MMA fight in my life, but they had energy drinks out and people were just wearing the shirts everywhere. And you’d see them at Beatdown Sports for, like, a hundred dollars for a shirt and you’d also see them for $15 at Winners. It was my first go at musical comedy, so I just kind of picked it… I don’t know why. It seemed like a ridiculous thing. The goal was to see if I could do an entire album of songs about TapouT but never mention MMA and just mention how nice the shirt is. That was kind of the goal. Why specifically TapouT? I’m assuming a lot of the other fight shirts were also in those discount bins. And I’ve always thought that Affliction is the most egregious of the fights shirts. So how did you end up at Beatdown, buying TapouT gear? I’d been playing around with doing musical comedy a little bit. I used to do other kinds of comedy and then I decided… I had a gig coming up and I was like “maybe I’ll just try doing a full set of music.” And the only songs I’d written were just to email to my friends and they were all about TapouT. I just wanted to put on a good show, so I rented a keytar — I didn’t own a keytar at that point — I rented a keytar and went down to Beatdown Sports, spent a lot of money hoping that this would be good enough that I could do it again, but I had no idea at the time. We bought hats, we bought shorts, a shirt. At the time it was the most expensive outfit I owned. So the TapouT investment was clearly worth it. It really was. It got me to Montreal Sketch Fest. I won Best Newcomer this past year. I did it here at Toronto Sketch Fest last year and won Best Musical Sketch and I got invited to do some dates in the states. I got invited down to Philadelphia and New York, just because of the TapouT stuff. At what point did you invest in your own keytar? When the album came out. It was a gift to myself. I’d been renting it for a year and teaching myself how to play keys and write music, so every time I’d have a show I’d rent it and then I would keep it for an extra week to learn how music is made. But when the album came out, I just decided to buy it as a gift. I bought the one that I’d been renting. Have you invested in any more TapouT gear? Yeah. I’ve got a bunch more hats, a bunch more shirts, a ton of socks. I was at Factory Direct, this discount store in Toronto here, and they had so many TapouT ankle socks. Whenever I went out on the road with TapouT, I’d bring them and try to lose them all, and anybody who knew the lyrics got a pair of socks. You have a good range of gear there, and TapouT makes a whole range of products, including home gym equipment and foam rollers. But your lyrics focus primarily on their t-shirts. Why is that? That’s my favourite part. The shirt. That was the whole goal, just be as simple as possible. The joke is made in the very first song, and then that joke is made a million times over and over again. But in so many creative ways. Yeah. It’s getting harder and harder. But yeah. Are you still writing TapouT songs now? Not anymore. I just put a new album out last week that I’m really proud of called LIVE! From The Rotary Club. But I did put out a Christmas TapouT album this past Christmas. It’s eight original songs. I had two days off of work, I was sick at home, so I just banged out eight songs, but I didn’t think that was long enough for an album, so I took the original album and put sleigh bells on every track. So that’s something that exists. But yeah, I’m kind of moving on from the TapouT stuff these days with the new record. TapouT was mostly me learning how to do this stuff, like musical comedy and performing it and writing it, that kind of thing. Nothing was really developed. If TapouT commissioned you to make a signature Marty Topps t-shirt, what would the design be? It would be a big picture of my face, with the TapouT logo, right across my face, and my eyes are peeking out over the logo. I’ve dreamed of this. I used to try to email them, before the record or anything, I thought it would be funny to get a letter from them, so I used to try to email their marketing department and be like, “I wrote these jingles for you and I’ll give them to you for free” and then eventually the emails started bouncing back.